President Obama’s war against ISIS is off to a “shaky legal start.” Since August, Obama enacted two strategies against ISIS, actions that may not be legal. On September 17, Obama signed a bill into law that gives the US military a “green light” to arm and train “moderate” Syrian rebels to fight against ISIS; one of the two measures the President has taken. Supporters of the strategy agree more must be done to combat ISIS as it moves quickly through Iraq and Syria. However, several lawmakers are either skeptical or oppose the plan entirely. They fear more harm than good as it would involve handing weapons to the groups whose top priority is to topple the Syrian President Bashar Assad. The Senate initially opposed the plan as well, fearing documented reports of ties between “moderate” rebel forces and ISIS and an accidental arming of ISIS. Nonetheless, within one month the plan was put into action, and on October 21, ISIS fighters seized “at least one cache” of weapons airdropped by the US after missing its intended recipients. The lost weapons were “more an embarrassment than a strategic loss,” as ISIS already possesses US weaponry worth millions of dollars that they captured from fleeing Iraqi soldiers. Currently, Obama’s second plan of action is intensifying. Along with the support of the Syrian rebels, the President authorized airstrikes over ISIS positions in Iraq and Syria. 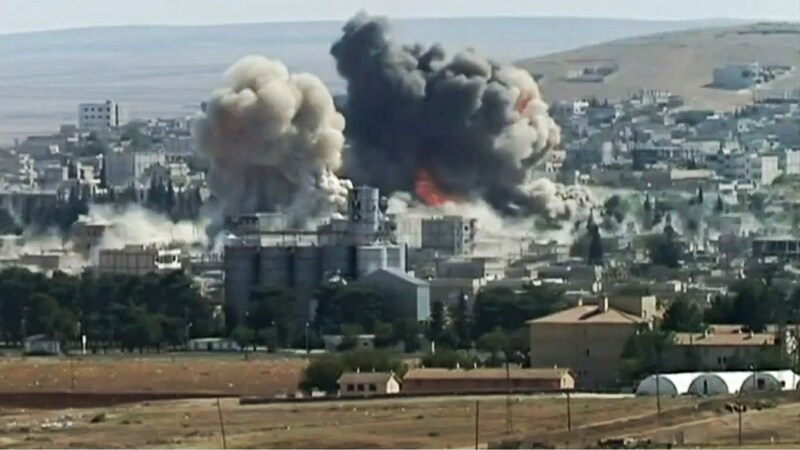 The airstrikes have been extreme, while producers of weaponry have reported soaring share prices. Support for Syrian rebels and airstrikes are attempts at keeping American “boots off the ground.” There are requests for US troops on the ground; however, Obama has not asked Congress for legal authority to formally declare war. Obama repeatedly cited the 1973 War Powers Resolution this past summer, which held that the President has a 60-day window to conduct hostilities without an act of Congress. Here however, the 60-day window expired as of October 7. Absent an explicit authorization by Congress or the War Powers Resolution, wars lose their legality. This justification is “implausible.” The 2001 AUMF requires a nexus to the group responsible for the 9/11 attacks, and the 2002 AUMF was approved for the invasion of Iraq to overthrow Saddam Hussein. Both resolutions pre-date the existence of ISIS. Supporters of the justification argue that ISIS is comprised of members who were part of the group responsible for the 9/11 attacks, creating the nexus. However, even this argument is flawed considering ISIS and al-Qaeda are no long affiliated and al-Qaeda publicly renounced any association. Additionally, airstrikes have extended beyond Iraq and into Syria. Continued reliance on the 2002 AUMF is flawed. Legality of the military action is also questionable in the realm of international law. Because the US is using force in another country, the operations are lawful, as defined by the UN Charter of which the US is a founding signatory, only if they can be justified under international law. Under international law, use of force by a third party is justified If: (1) the intervention is authorized by the UN Security Council, (2) it is a clear case of self-defense, or (3) if assistance is requested by the other country’s government, force may be authorized. Here, it is true that the Iraqi Government requested US assistance in halting the spread of ISIS and to prevent the genocide of Iraqi religious minorities. However in Syria, none of these conditions apply. Unlike the strikes in Syria, the Obama administration relies on a principle of self-defense to justify attacks in Iraq. The administration argues ISIS infiltrated Syria to attack Iraq, and although Syria has not formally invited the US, the Iraqi government has. The administration explained its strikes in Syria in a letter to the U.N., claiming that the US has the right to attack ISIS in Syria to defend Iraq because Syria is “unable or unwilling to prevent the use of its territory for such attacks” and “states must be able to defend themselves, in accordance with the inherent right of individual and collective self-defense.” The UN stated that the US initiated necessary and proportionate military actions in Syria to “eliminate the ongoing [ISIS] threat to Iraq.” Therefore, the defense of Iraq, not necessarily Syria, triggers the right to use force against ISIS in Syria. Arguably, attacks in Iraq are justified under a right to self-defense as ISIS has and continues to conduct armed attacks of sufficient scale by seizing towns and cities, undermining the “territorial integrity” of Iraq. International law permits non-state actors to carry out armed attacks to defend a country. In Syria though, lack of action has allowed ISIS to operate with impunity, leading to ISIS’s growth in Syria and expansion into Iraq. It is critical to the legality of US action that the Syrian regime lack capacity and capability to dismantle ISIS. That the regime may be willing to tackle ISIS is not enough to prevent Iraq or its allies from invoking the self-defense doctrine. Without inability and unwillingness, any US action remains illegal under international law. On September 23, the UN Secretary General endorsed US action, noting Syria had over two years to dismantle ISIS and the strikes “took place in areas no longer under the effective control of [Syria].” Additionally, international law requires any defensive attacks against ISIS be proportionate to the scale of ISIS’s attacks, and any response have a reasonable objective. Further, the response cannot go beyond achieving the objective. Thus, any airstrikes against ISIS assets, bases, and fighters in Syria must be proportionate, but not necessarily equal, to ISIS’s attacks against Iraq, and the attacks may not go beyond the objective, in this case, to dismantle ISIS. The legality of US action is uncertain. Iraq has an indisputable right to self-defense against armed attacks by ISIS in Syria, but only if it can be shown the Syrian regime is unwilling or unable to control the threat. This legal right extends to the US as Iraq authorized the US to intervene on its behalf in self-defense given Iraq’s own inability to do so independently. Obama may have lost legal justification under domestic law, but he might get away with carrying out military action under international law, especially given Syria’s lack of interference with the operations so far.